Manipulation is often thought of as morally repugnant, but it might be responsible for the evolutionary origins of some helpful or altruistic behavior, according to a new study. In evolutionary biology, manipulation occurs when an individual, the manipulator, alters the behavior of another individual in ways that is beneficial to the manipulator but may be detrimental to the manipulated individual. Manipulation not only occurs in humans and animals but also at the cellular level, such as among cells in a multicellular organism, or in parasites, which can alter the behavior of their hosts. 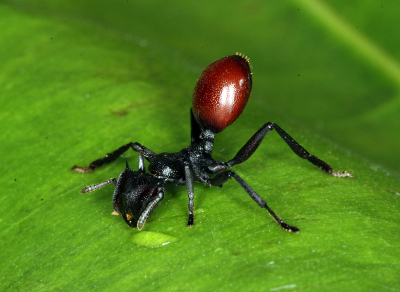 Consider the case of the parasitic roundworm Myrmeconema neotropicum, which once ingested by the tropical ant Cephalotes atratus in Central and South America, causes the ant to grow a bright red abdomen, mimicking berries. This bright abdomen constitutes a phenotype manipulated by the roundworm. Birds eat the "berries," or infected ants, and then spread the parasite in their droppings, which are subsequently collected by foraging Cephalotes atratus and fed to their larva, and the cycle of manipulated behavior begins anew. In the study published today in the journal American Naturalist, the researchers developed a mathematical model for the evolution of manipulated behavior and applied it to maternal manipulation in eusocial organisms, such as ants, wasps, and bees, which form colonies with reproductive queens and sterile workers. In the model, mothers produce two broods, and they manipulate the first-brood offspring to stay in the maternal site and help raise the second brood. Mothers can do this by disrupting the offspring's development in some way, for example through poor feeding or aggressive behavior. Manipulated offspring of the first-brood stay and help to raise the second brood. Alternatively, first-brood offspring can resist manipulation and leave. The researchers show that an offspring's resistance to manipulation may often fail to evolve, if the costs of resistance are high. In a sense, then, helping or altruistic behavior is coerced through manipulation. "The evidence in so-called primitive eusociality, where helping is often coerced through aggression or differential feeding, appears consistent with these results," said lead author Mauricio González-Forero, who conducted the study while a graduate research assistant at the National Institute for Mathematical and Biological Synthesis.